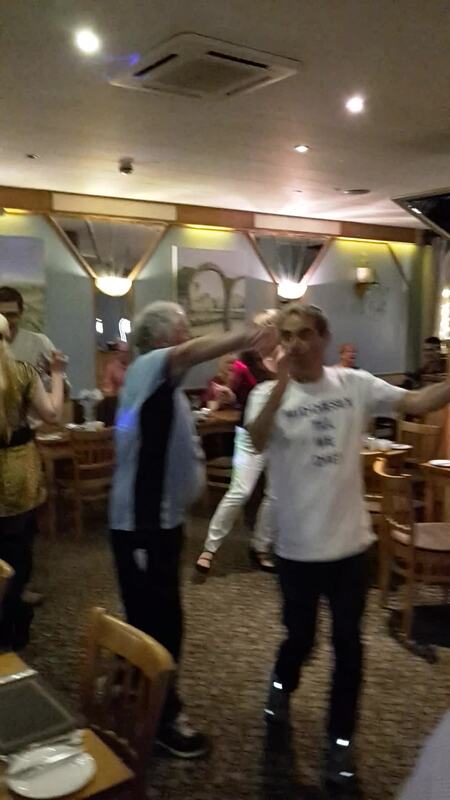 In case you don't know this is one of Barmy Kev and Seaxe Man showing off their moves at a Southport establishment. This is funny enough on its own However, please think of something witty to do justice to our slick movements. I believe Chunky won last competion pre season so has the hounour of judging as well as entering if he wishes. Edited 1 time(s). Last edit at 2018:12:14:17:48:37 by BarmierKev. The Southport qualifying heat of 'Strictly' produced a disappointing turnout. Middlesex fans showing footwork some players can only dream of. News comes in that Eoin Morgan has just reached double figures. The surgeon declares the operation to add two legs to Kev's arm was a complete success and should reduce the chances of him getting legless. It's the Twenty 20 season and Kevin and S_M celebrate Middlesex winning......the toss! Craig Revel-Horwood.- 'This was a very difficult choice. Graeme and Oti danced very well, but the couple I am going to save are Seaxe Man and Kev'. Roy is giving his best showing of Green Door,whilst Kev insists on more Red,Red,Wine. Roy and Kev have been practicing new coach Law's training schedule. New batting coach thinks Seaxe Man and kev have potential for dancing down the wicket. New bowling coach also impressed with the swing they produce. Not shown but the impressionist singer was very good, A bloke who kissed 70 goodbye awhile back I would say. Glanced away once and when I looked back he had donned an Elvis Presley Mask and launched into a range of the King's songs. Very good. But then after a few pints suddenly an old favourite of mine, Frankie Vaughan's Green Door from the fifties boomed out. I said to Kev, gotta do this one mate and we did. A great evening on a wet day. I would add that Rod/Ed was also pretty nifty on his pins as well. Plus one of that ensemble picked up a pint, maybe cider, and downed it in one swallow. Good stuff. Roy and Kev heard that the 100 ball rubbish had been stopped by ECB. Will announce the result on Sunday afternoon. S-M : Listening to this music has given me an idea for the message board. Kev: Try to keep 'in hold', what's your idea? S-M: We ask for song titles with the names of Middlesex cricketers. Kev: Nah, that'll never catch on. Therefore the winner is Mr D Bags. Open top bus tour will start from Grace Gates 11.00 on Friday. Congrats Dingy,will be with the MTWD cheerleaders on Friday morning.